Heat treating furnaces are essentially heating chambers, i.e., a refractory vessel which holds the steel stock as well the heat. The furnace chamber is heated with some source of heat. The supply of heat has to be regulated depending on the requirement. More heat is needed during the heating period, but almost a constant heat is required when the furnace has attained the required temperature and is to be maintained at that temperature. The heat has to be supplied to the whole of the properly designed furnace in a way that the temperature is constant everywhere, or at the places where the charge is being kept otherwise some parts may get under heated, or overheated. The doors, or openings are kept as small sized as possible to reduce the heat losses. Tempering and low temperature furnaces may require provisions for forced air or atmosphere circulation. The carburised parts may be quenched inside the furnace itself. The heat treatment furnaces play a very important role in imparting reproducible useful properties to the steel components. The design of the furnace is determined by the stock which is to be treated and the particular treatment which has to be carried out at the special temperature. When parts are required to be heat treated at different temperatures, several furnaces may be required as a furnace which may be suitable for use at 1300°C, may be unsuitable for use at 300°C, although the latter temperature is within its maximum temperature range. A bath type of furnace with a rectangular heating chamber and one or more doors for charging and unloading, is very widely used for heat treatment purposes. Here a batch of parts is charged for heat treatment, it is taken out after heat treatment, then a second batch is charged into the same furnace, then the third batch and so on. These furnaces find applications in tool making and maintenance shops. A muffle is a hollow cuboid or cylindrical retort made of special refractory material, or non-scaling steel. 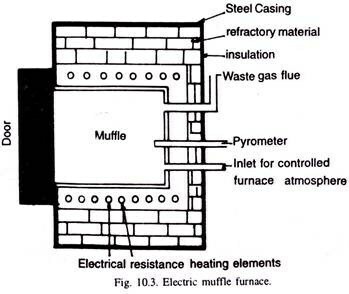 A furnace, in which the heat source does not directly make contact with the material being heat-treated, is described as a muffle furnace. The components are charged in a muffle, and gas firing, or electrical energy can be used to heat the muffle from outside. The gas is burnt outside the muffle, and the heating is effected by the hot gases which are made to circulate through the ring like space between the interior-wall and the exterior-muffle wall. The products of combustion of the gas do not enter the heating chamber (the muffle), and thus, the atmosphere of the furnace can be controlled, and thus, scaling of the components can be prevented. Also, such a furnace gives reasonable uniformity of temperature distribution. Fig. illustrates such a furnace schematically. Gas carburising of small parts such as parts of cycle-chain is carried out in a non-scaling steel retort (muffle) revolving around the horizontal axis. Commonly, electrically heated muffle furnaces are extensively used for the heat treatment of small sized components. Fig. illustrates heating element like nichrome or kanthal wire wound around the muffle, or are placed in the ring-like space to heat the muffle with its contents. For high temperatures, electric muffle is heated by glow bars, or radiant elements, where the steel gets heated by direct radiations. Muffle furnaces are used for bright annealing, nitriding, carburising, bright hardening.